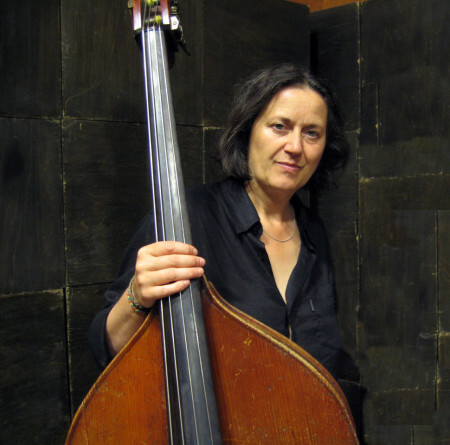 Joëlle Léandre studied both piano and double bass from the age of 9 to 14 in her home town of Aix-en-Provence. Her double bass teacher, Pierre Delescluse, encouraged her to apply to the Conservatoire National Superieur de Musique de Paris where she won first prize for double bass. In 1976 she received a scholarship to the Center for Creative and Performing Arts in Buffalo, a time that was to prove particularly influential due to encounters with Morton Feldman, and the music of Earl Brown, John Cage and Giacinto Scelsi. Léandre has continued to perform contemporary repertoire, not only as a member of ensembles such as 2E2M, Itinéraire, and l’Ensemble Intercontemporain but particularly through the works of Cage and Scelsi, several of which have been recorded by her. After listening to jazz (Mingus, Cecil Taylor, Monk, Dolphy), she became interested in free improvisation, and has worked with a wide range of improvisors, including Derek Bailey, Maggie Nicols, Lindsay Cooper, Irène Schweizer, Fred Frith, Evan Parker, Eric Watson, Lol Coxhill, Peter Kowald, William Parker, and Barre Philips. She is a member of the European Women’s Improvising Group (recorded on Intakt 002). She has recorded one of the weirdest records (even by free improvising standards) in Les domestiques with Jon Rose – a collection of domestic noises set to musical effect – and more recently has formed The Canvas Trio with long-term associates Rüdiger Carl and Carlos Zingaro. In 1994 Léandre was the DAAD artist in residence in the city of Berlin. In 2002 she was invited as visiting professor for improvisation and composition at Mills College in Oakland, California, and again in 2004 as visiting Darius Milhaud professor for composition and improvisation. Saxophonist/composer Phillip Greenlief has performed internationally in a variety of settings across North America and Europe. In 1998 he lived in Saint Petersburg (Russia) where in addition to playing solo he performed and recorded with several jazz groups, singer-songwriter Yelena Kolokolnikova, and the Russian folk ensemble Dubinushka. In addition to solo performance, Greenlief plays in duo with Joelle Leandre; in saxophone trio with Frank Gratkowski and Jon Raskin; trio w/GE Stinson & Steuart Liebig; in shudder, w/Kyle Bruckmann & Lance Grabmiller. He is a founding member of The Lost Trio, now in their 11th year of music-making. Over the past decade, Greenlief has produced concerts for local musicians and internationally touring artists under the auspices of Evander Music Presents, and is curator at ImprovGarage, a monthly workshop dedicated to the proliferation of innovative composition and improvisation techniques for large ensemble. He received the 2000 San Francisco Bay Guardian Goldie Award in music.